The CdTe Team at NREL has the ability to grow polycrystalline CdTe based photovoltaics with a baseline of ~15% efficiency in a superstrate configuration  and in a substrate configuration >10% efficiency . While the bandgap of CdTe is ~1.5 eV, devices regularly have open circuit voltage (Voc) ~850 mV. Our group is presently working on increasing the voltage, with a recent demonstration using single crystal devices having voltages in excess of 1,000 mV . Substrate devices have the n-type contact (transparent conducting oxide [TCO]) exposed at the end of fabrication. Superstrate devices have the p-type contact exposed. This is normally metallic, although we have the ability to use a TCO instead. Of further potential interest, we have recently demonstrated the capability to expose the heteropartner (CdS) from high efficiency superstrate devices with a controlled delamination technique. This can enable access to the n-type contact after a TCO regrowth or to the junction without TCO regrowth, if desired. Standard (glass) sample dimensions are 1.5"x1.5". Standardly we grow cells from 0.25 to 1 cm2 on 1.5" glass substrates, but dimensions and shapes can easily be altered. During this fiscal year, we are building a vapor transport deposition capability that should be able to grow CdTe up to 6"x6". We have equipment capable of performing all other necessary fabrication steps at this size scale. If samples were desired of these dimensions, time would be required to calibrate and optimize to achieve similar efficiencies as we can at 1.5". We have the ability to grow a variety of high performance TCOs including In2O3:Sn (ITO), SnO2:F (FTO), Cd2SnO4 (CTO), and ZnO:Al (AZO); buffer layers (SnO2, ZnSnOx), and back contacts (Cu/Au, ZnTe:Cu/Ti, AquaDag, Mo/CuxTe). NREL also has ties with all active academic CdTe research programs in the United States in addition to the major industry players. This is the only high efficiency CdTe PV capability in the national lab system. This capability includes the ability to deposit every layer from transparent conducting electrode (TCO) through back contact. It also includes high temperature sputter, close-space sublimation (CSS), and metal organic chemical vapor deposition (MOCVD) capabilities with EHS controls in place for toxics. We also have the ability to alloy CdTe through a variety of approaches and modify surfaces and interfaces as needed. CdTe is presently the lowest cost photovoltaic material system (even lower than Si) and produced at industrial scales at >2 GW/yr. The capability to grow every layer of high performance devices enables tuning of novel layers for water splitting applications. NREL has the premier photovoltaic characterization tools in the national lab system with a complete suite of tools ranging from device level (e.g., solar simulation, quantum efficiency) to material properties/performance (e.g., photoluminescence [low-temperature, time-resolved, large area imaging], photoemission spectroscopy, cathodoluminescence, secondary mass ion spectroscopy, auger). We can produce ca. (64) 1.5" samples/month at maximum capacity. Significantly higher throughput will become available when the large format tools come online in 2017. Samples can be made available for partners in the EMN. We regularly work with a series of external partners (academic and industry). CdTe is a remarkably stable material that may have enhanced stability (compared to other PV materials) in the extreme pH solutions required for PEC. Careful choice of electrolytes in both high or low pH applications may mitigate or eliminate etching. CdTe has an appropriate voltage for two devices in series to be of high utility for water splitting. We are actively working on increasing CdTe open circuit voltage, under the auspices of SuNLaMP, with demonstrated success already in model systems. Our baseline processes can generate samples of interest to partners. We can make materials/devices that can be used at NREL or in other parts of the EMN in PEC devices/modules. We have the most complete set of photovoltaic specific characterization tools in the EMN for both materials and devices. These directly are applicable to PEC materials and devices. 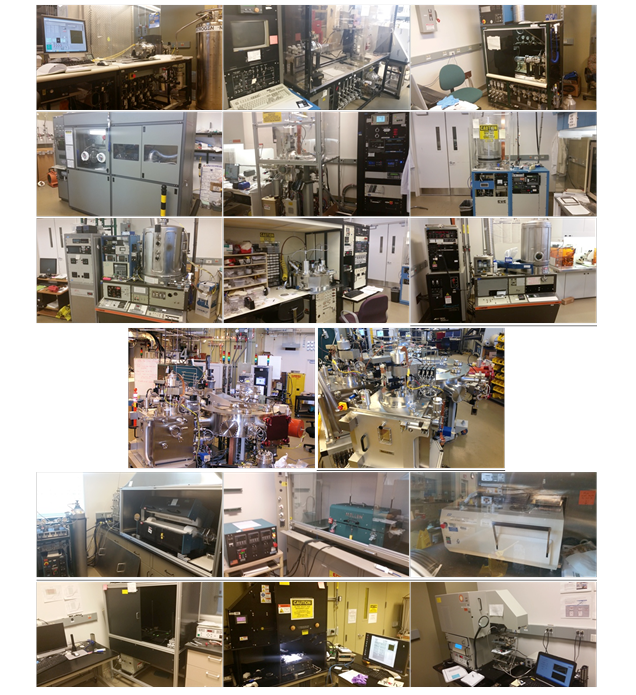 Top row, left to right: Close-space sublimation systems #1-3 (custom built) for CdTe deposition and CdCl2 treatments [1.5"x1.5" samples]. Second row, left to right: Metal-organic vapor deposition system (CVD, inc.) for front contacts (FTO/SnO2) [4"x12" samples], sputter system #1 (Lesker) for front contacts (ITO, CTO, ZTO) and heteropartner (CdS) [4" square samples], sputter system #2 (CVC) for front contacts (CTO, ZTO) and heteropartner (CdS). Third row, left to right: 3-source evaporator (Veeco/custom) for back contacts/alloys (Cu/Au, ZnTe:Cu, CdZnTe alloys), sputter system #3 (Unifilm) for front contacts (ITO, AZO, CTO, ZTO), heteropartner (CdS), back contacts (Ti, Mo, CuxTe, ZnTe:Cu) [4" diameter samples], E-beam evaporator (Varian) for back contacts (Au, Ni, Ti). Fourth row, left to right: Two views of large area (6"x6") sputter and MOCVD cluster tool (AJA, Lesker, & SMI) for front (FTO, SnO2, CTO, ZTO, ITO, AZO, ZnO) and back contacts (Cu, ZnTe:Cu, Mo, Ti, CuxTe) and heteropartner (CdS). Fifth row, left to right: Annealing equipment: tube furnace (Lindberg) [3"x12"], tube furnace (Mellen) [1.5"x1.5"], glovebox-integrated rapid thermal processor [6"x6"]. Sixth row, left to right: Device characterization equipment: superstrate solar simulator (Oriel, Class ABA, 6"x6"), substrate solar simulator (PV Measurements, Class AAA, 6"x6"), internal quantum efficiency measurement system (Oriel) [many other device and material specific equipment not shown]. 1. H. Mahabaduge, W.L. Rance, J.M. Burst, M.O. Reese, D.M. Meysing, C.A. Wolden, J. Li, J.D. Beach, T.A. Gessert, W.K. Metzger, S. Garner, and T.M. Barnes, "High efficiency, flexible CdTe solar cells on ultra-thin glass substrates," Appl. Phys. Lett. 106, 133501 (2015). 2. R.G. Dhere, J.N. Duenow, C.M. DeHart, J.V. Li, D. Kuciauska, and T.A. Gessert, "Development of substrate structure CdTe photovoltaic devices with performance exceeding 10%," in Conference Record of the 38th IEEE PV Specialists Conference, Austin, TX, 2012. 3. J.M. Burst, J.N. Duenow, D.S. Albin, E. Colegrove, M.O. Reese, J.A. Aguiar, C.-S. Jiang, M.K. Patel, M. M. Al-Jassim, D. Kuciauskas, S. Swain, T. Ablekim, K.G. Lynn, and W.K. Metzger, "CdTe solar cells with open-circuit voltage breaking the 1 V barrier," Nat. Energy 1, 16015 (2016).